Finishing your basement can be a great way to expand living space and increase your home’s resale value. However, simply putting up drywall and laying down new carpet or flooring isn’t enough to get the job done. 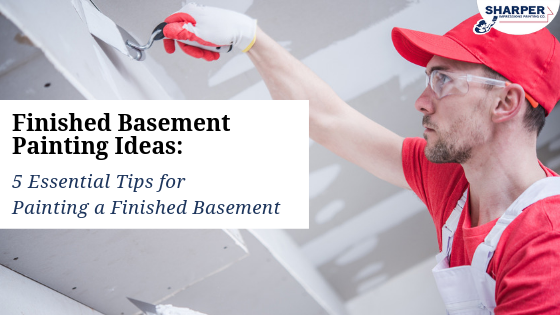 Even finished basements can look partially-finished, drab, and uninviting if they aren’t painted properly. But, you can turn your dull basement into a warm, enjoyable living space by following these finished basement painting ideas and tips. If your finished basement is like most, it probably doesn’t receive ample natural light. A simple solution to combating low light levels in basements is to use deep or bright saturated paint colors on your basement walls. They are great to use on every wall or just one wall to create a focal point. While you may think that you should only use lighter colors to liven up a dark living space, these hues can’t release their full potential unless your lighting is bright enough. Whether you want to warm up or brighten your finished basement, consider the following paint colors to create a more inviting space in your home’s lower level. Paint your basement walls brown. Brown is a great, rich neutral for finished basement walls. This warm earth tone creates a cozy, enveloping feel whether it’s used against white trim or natural wood accents. Paint your basement walls gray. Gray paint is a trend that can be embraced all throughout your home — including your basement. This sophisticated paint color is quite versatile and can look beautiful with neutral furniture, or bold and bright fabrics and decor. Paint your basement walls blue. A medium or even dark, navy blue can be ideal for enhancing a basement space and lifting the spirits of anyone who walks downstairs. Blue shades give off calming effects and look pristine with lighter trim and soft, neutral accents. Paint your basement walls green. Energize your finished basement by adding a rich green accent wall, or painting all of your walls in a dark or light green. All tones of green paint can liven up a basement space in different ways: Dark greens give off a cozier effect, brighter greens give off a sense of whimsy, and saturated light greens like sage can induce a calming effect — perfect for basement bedrooms! Paint your basement walls white. Of course, white can also be a great choice to brighten up basements. However, this color can look uninviting or plain if you don’t use proper decorations or lighting. Make sure to break up the white walls with pops of color in the carpet, in furniture fabrics, or decor and ensure overhead lighting is bright and crisp. Paint your basement walls dark. Many people use their finished basements as a place to relax – whether for movie nights, game nights, or lower-level bars. Basement pubs are quite popular in finished basements and dark colors help these spaces embrace a cozy feel. Similarly, home theaters and game rooms love dark wall colors which can help create a theater-like atmosphere. Try using dark grays, greens, and blues. Add floor or table lamps. In addition to the standard lighting in your basement, incorporating table lamps and floor lamps can shed more light on your space, plus spruce up a space with more color. Install recessed lighting. Recessed lights work extremely well on low ceilings that hang over bars, game tables, or other activity areas. They can also add a nice modern touch to a finished basement. Hang overhead lamps or track lighting. Both can be an inexpensive option to add more light to a dark basement. A finished basement isn’t truly finished until you paint the ceiling. Neglecting basement ceiling painting can make your space appear unfinished and drab. Try the following ideas to help spruce up your ceiling and make your basement look more like an extension of your home’s main living space. Paint your basement ceiling black. While it may seem counterintuitive to paint an already-dark and low drywall basement ceiling black, doing so can actually help it appear higher plus cover any flaws. Black paint basically disguises a ceiling which can create the illusion of added height. Plus, dark paint is great for home theaters! Paint your basement ceiling white. Brighten up your space by using white paint on your basement ceiling. A white ceiling will create an airy, open ambiance even if your walls are a darker or more saturated hue. Leave your basement ceiling exposed, then paint. Drywall and drop ceilings tend to make basement spaces look smaller. Instead of using drywall on your basement ceiling, consider leaving it exposed and then paint your beams and ducts black or white. This painted ceiling trick can give your basement an industrial, loft-like feel. Try painting your ceiling in a flat, dark paint to give it an open quality without closing it in. After painting the ceiling, paint the walls in a slate gray to keep your finished basement on the modern, sophisticated side. Brick can often be found in basements of older homes. While old, basement brick fireplaces or other exposed brick elements can look beautiful as is, many times you will find that the masonry is quite dated or dirty. This is why painting exposed brick in your basement can often be a good choice. Painting basement brick in white, gray or a complementary color that plays off your other basement walls can quickly liven things up and bring your space into the 21st century. A free basement painting quote. Professional painters will get you a computer-generated quote that is accurate and detailed in just 10 minutes. Expert guidance on choosing basement paint colors. If you’re torn between a few colors, an expert paint color consultant will make an in-home paint color consultation visit free of charge. Professional painters want you to be happy with your paint color choice, and this step ensures that you will love it! Ensure a mess-free painting process. Professional basement painters will protect your belongings and floor with drop cloths, tarps, and painters tape to ensure that paint stays only on designated walls, ceilings, or trim. Prepare your space for painting. Depending on your quote, you can rest assured that any holes or cracks in walls or ceilings are repaired, filled, or sanded. This will ensure a smoother paint application. Use the correct paint and primer. Expert painters will use a top-quality latex primer and acrylic latex paint in a glossy finish. A latex primer will provide a uniform finish and glossy paint will ensure that walls and ceilings resist basement moisture. Inspect the project. A professional painting company will ensure everything is inspected and give you the opportunity to review their work to ensure the finished job is up to your standards. Are you ready to paint your finished basement? The professional interior painters at Sharper Impressions offers expert interior painting, and drywall repair services to revamp your finished basement. Get your free basement painting quote today!